Along with the medications that treat multiple sclerosis (MS), rehabilitation is a key part of managing your condition effectively, particularly after a relapse. Depending on your symptoms, you may only occasionally need rehabilitation or you may require these therapies regularly to help you stay as healthy as possible. From physical therapy to speech-language therapy to cognitive therapy (and more), there are a number of effective, engaging rehabilitation options that can minimize the impact of MS-related disabilities and help you function at your best in every aspect of your life. Physical therapy can help treat a number of MS-related symptoms and needs. Walking problems are extremely common in MS and may be one of the first symptoms you experience. Physical therapy can help you improve your mobility and independence. 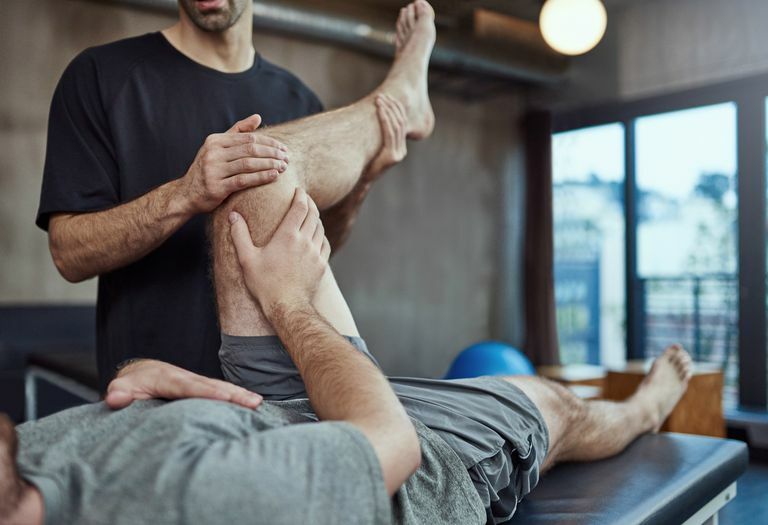 A physical therapist can teach you exercises to reduce muscle pain, spasticity, and weakness, as well as help you improve your balance, coordination, strength, and flexibility. This may delay your need for a mobility device and help prevent falls, something that can put you five steps back in your MS care. If you do need a mobility device (or you're not sure if you're using the right one), a physical therapist can help you find what's best for you. Examples of mobility devices include single-point or quad canes, motorized scooters, rolling walkers, and manual or power wheelchairs. You may also be surprised to learn that, in addition to muscle and mobility problems, physical therapy exercises can improve MS-related fatigue. Treating fatigue is pretty crucial since it affects between 75 percent and 95 percent of patients, and 50 percent to 60 percent report that it's one of the most difficult MS symptoms to deal with. One of the reasons that exercise helps is that being inactive actually contributes to fatigue by causing your body to work harder to do everything because it's out of shape. Exercise can also combat stress, help you sleep better, and improve your mood—all factors that can affect your fatigue level. A 2019 Cochrane overview of Cochrane reviews on rehabilitation therapies for people with MS determined that physical therapies such as exercise and physical activity may not only improve functions such as strength, mobility, and lung capacity, they can also reduce fatigue and improve your overall quality of life. Exercising with MS requires a delicate balance. You don't want to overexert or overheat yourself, so designing an exercise regimen with a physical therapist who works with people who have MS is your best bet. A physical therapist can teach you how to maintain good posture and body positioning, which may alleviate some of your MS-related pain. If you're in a wheelchair or you have limited mobility, proper positioning can also prevent pressure sores. Occupational therapy helps you maximize your daily functioning at home and/or in the workplace. An occupational therapist can work with you on ways to conserve your energy. For example, if your fatigue limits your ability to go grocery shopping, your occupational therapist may suggest using a scooter when running errands. Some occupational therapists also focus on cognitive rehabilitation and vocational rehabilitation (see below). As MS progresses, you're at an increased risk for developing problems with swallowing, speaking, and taking deep breaths. Often, these problems coincide because similar muscles are used to control all of these functions. A speech-language pathologist can help you tackle these difficulties with specific strategies. When a person with MS develops difficulty swallowing foods and liquids, this causes major concerns, including dehydration, poor nutrition, choking, and aspiration (when you breathe food or drink into your lungs). Speech problems are common in MS, affecting up to 40 percent of patients at some point. These problems may include difficulties with articulation (slurred speech), slowed speech, soft speech, or impaired voice quality like hoarseness, breathiness, or a nasally speaking voice. A speech-language pathologist can help reduce these speech difficulties by teaching you mouth-strengthening exercises. He or she may also recommend communication devices like voice amplifiers so you can be heard better. Some speech-language pathologists also do cognitive evaluations and cognitive rehabilitation (see below). Cognitive problems affect an estimated 34 percent to 65 percent of MS patients. They usually come on gradually and can occur at any time during the disease course. For some people, they're even the first symptom of MS. While there's no medication for such problems in MS, cognitive rehabilitation may help. It's performed by a qualified neuropsychologist, occupational therapist, or speech-language pathologist and helps you learn to compensate for your cognitive concerns and improve your overall function. The good news about cognitive function in MS is that it's rarely ever severely impaired. Regardless, even with mild cognitive deficits, you may feel isolated or anxious about engaging with others at home or at work. The cognitive therapies you need hinge on your cognitive evaluation. Some people with MS who have cognitive dysfunction choose to be evaluated if their cognitive issues are affecting how they function in their daily lives. Although cognitive testing can be time-consuming (it requires a number of standardized tests), it can help you develop a clear picture of how MS has affected your cognition or if there's another health concern going on, like depression or MS-related pain, which can worsen cognition. Seeking cognitive evaluations early in your disease and having follow-ups allows your provider to compare recent results to those of prior years, helping establish whether your cognition has worsened, stayed the same, or even improved. Cognitive testing can be expensive. Some insurance plans will cover it, though, so it's best to contact your carrier for more information. Based on your evaluation, your cognitive therapist may recommend one or more of the following, among other possibilities. The strategies you may use over time may also be changed. Stress management and psychotherapy may also be a part of cognitive rehabilitation, especially considering the fact that depression is so common in MS.
A 2017 review of studies on rehabilitation therapies in MS found moderate-quality evidence that cognitive-behavioral therapy (CBT), a type of psychotherapy, is beneficial for treating depression and helping patients accept and cope with MS. If you have symptoms of depression, be sure to talk to your doctor about getting treatment. Vocational rehabilitation specialists can train you to use assistive devices or make accommodations that adapt your current workplace to meet your needs, or help you find a new job that does. They also assess job readiness and perform job coaching and mobility training. Some occupational therapists also do vocational rehabilitation since there's quite a bit of overlap between the two disciplines. Vocational rehabilitation programs may be available through your county or state. Contact either of these for more information. Multidisciplinary rehabilitation programs involve a team of healthcare professionals from two or more specialties, such as medical, physical therapy, occupational therapy, speech-language therapy, cognitive rehabilitation, neurology, nursing, etc. These programs can be in-patient or out-patient. The aforementioned 2019 Cochrane review found that a comprehensive multidisciplinary rehabilitation program improves function and disability and leads to longer-term improvement in quality of life and activity. These findings suggest that utilizing all the rehabilitation therapies you need is a good way to maximize the potential benefits. Rehabilitation therapies play a paramount role in your MS health, but they aren't a quick fix—it takes time and patience to see results. You may experience obstacles and some frustrations along the way, but the overall benefits to your long-term health are worth it. Talk to your doctor about which rehabilitation therapies are appropriate for your individual needs and when you might need them. Keep in mind, too, that it's OK to switch therapists or therapy sites if you're not content with your current one. Getting a second opinion is never a bad idea, and sometimes it takes time to find the right healing, trusting relationship. Amatya B, Khan F, Galea M. Rehabilitation for People With Multiple Sclerosis: An Overview of Cochrane Reviews. Cochrane Database of Systematic Reviews. 2019;1:CD012732. doi:10.1002/14651858.CD012732.pub2. Khan F, Amatya B. Rehabilitation in Multiple Sclerosis: A Systematic Review of Systematic Reviews. Archives of Physical Medicine and Rehabilitation. 2017;98(2):353–367. doi:10.1016/j.apmr.2016.04.016. National Multiple Sclerosis Society. Fatigue: What You Should Know. Updated 2019. https://www.nationalmssociety.org/NationalMSSociety/media/MSNationalFiles/Brochures/Brochure-Fatigue-What-You-Should-Know.pdf. National Multiple Sclerosis Society. Managing Cognitive Problems in MS. Published 2019. https://www.nationalmssociety.org/NationalMSSociety/media/MSNationalFiles/Brochures/Brochure-Managing-Cognitive-Problems.pdf. National Multiple Sclerosis Society. Speech & Swallowing: The Basic Facts. Published 2014. https://www.nationalmssociety.org/NationalMSSociety/media/MSNationalFiles/Brochures/Brochure-Speech-Swallowing-BasicFacts-FINAl.pdf.